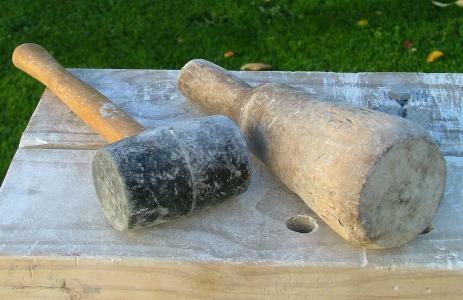 The type of mallet that you use for stone carving can depend on the type of stone that you use. There are three types that are suitable; rubber, wooden and metal. The metal one is for harder stone like marble and is for a more experienced sculptor to use. For soft stone either rubber or wooden will do. So what is the difference? For small sculptures an absolute beginner could go with the rubber tool and achieve great results. If you are interested in sculpting long term and advancing to larger pieces, like a stone garden sculpture, then the rubber one tends to bounce back when you hit the chisel and you will find it more difficult to remove any stone. On the other hand the wooden one works great for your larger pieces and you can go ahead and chip away at the stone garden sculpture. You will pay a little more for the wooden one but that is what I would recommend for ease of use.